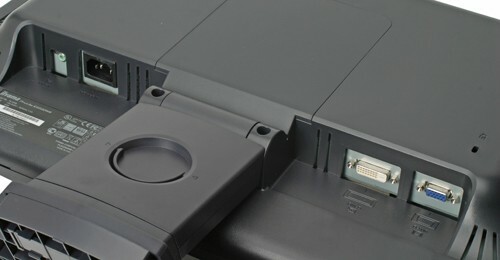 Iiyama ProLite E2200WS LCDIiyama is a well known UK brand specialising in LCD monitors. The ProLite E2200WS 22' widescreen LCD is a solid 22' monitor. The base is plastic but this is no cause for concern as the set-up is stable and the monitor can tilt backwards or forward for the best viewing experience. There is a comprehensive list of controls that give you access to all the settings. You will not need to do much in terms of sizing as the screen is great at auto-detecting resolutions and adjusting accordingly. The speakers are no great addition but this would not surprise as monitor speakers can rarely be used for serious sound monitoring. In this case it is not very easy to listen to the sound of a movie as the output of the ProLite E2200WS 2x1W speakers is very low. With 5ms response time, contrast ratio of 1000:1, brightness on 300 cd/mÂ² and a native resolution of 1,8 MegaPixel you would expect a superb LCD monitor. However it seems that from apart the recommended 1680 x 1050 resolution the ProLite E2200WS-B had strong font blur, was distorting the images and overall the video quality was poor. Iiyama admits on it's website that under any other resolution - and you might find 1680 x 1050 too small for your liking - the monitor under-performs with overall picture quality. For a new LCD monitor that costs around Â£240 this is not acceptable though. Iiyama has this time failed to deliver quality for money and instead released a monitor restricted to one screen resolution. Even then it doesn't perform as one of the other top 22' TFT on the market. You might therefore want to check out alternatives before deciding to buy the ProLite E2200WS, unless 1680 x 1050 is your resolution of choice.